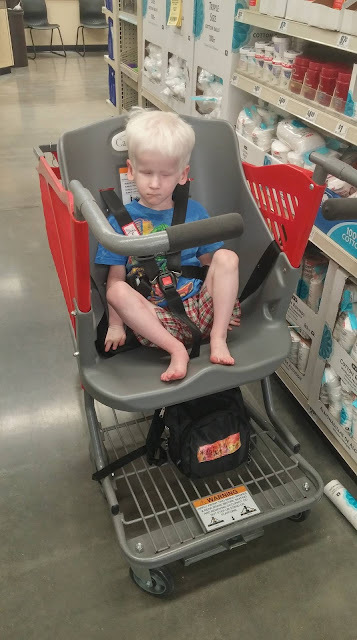 In 2012, when our family lived in Maryland, I wrote a post on June 1, 2012 about then 22.5 month-old Orion titled, "There's No One Like Orion" and talked about "Orion Syndrome". Now I can say there's two of a kind! There are pictures of both Orion and Clarisa here and I will tell you who is who at the end of this post. 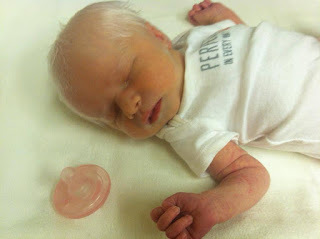 (Image description: Seen from the chest up to the head, a white haired infant, eyes shut, a pink binky lays nearby. In Wisconsin on June 30, 2015, a Deaf couple, Justin and Rachel, who we knew from our days in Maryland, gave birth to their fourth child. Their new daughter, Clarisa Delilah Vollmar, was born with amazing white hair and her eyes were yet to be seen. Our mutual friends were immediately busy tagging the adults of both our families on Facebook. What are the odds of two families, each with a DeafBlind child with white hair born years apart in different geographic locations, knowing each other prior to the arrival of Clarisa? The Vollmar family knew of Orion when he was born, too! Our older kids played together occasionally before the Vollmar Family moved to the midwest when Orion was around a year old. Who knew the circumstances of Clarisa's birth would reconnect us? After my first reaction of shock learning that there was another kid exactly like Orion in Clarisa, I was so happy for Clarisa and her family. My joy was flavored with knowledge of the challenges that lay ahead of them as our family started traveling on our path with Orion almost 5 years before (Orion turned 5 on July 19th, 2015). 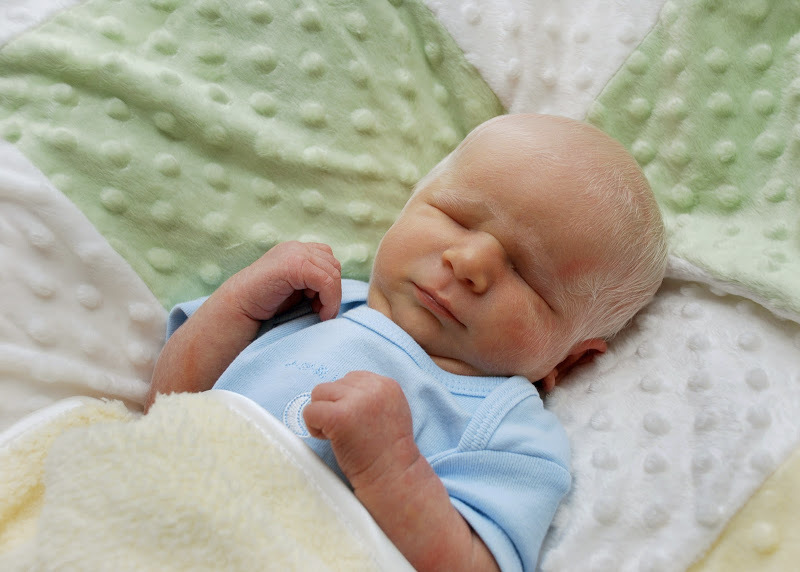 Photo #3: A swaddled baby burrito! 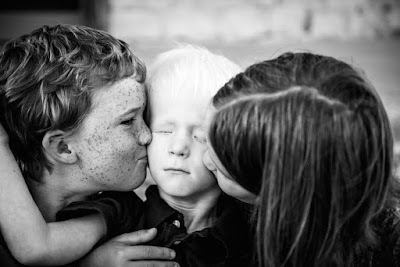 Separately, I showed the picture Clarisa's parents posted of her on Facebook to Orion's big siblings Skyler and Anastasia. When asked who that picture was of, both replied, "Orion." They were so surprised and amazed, too. Someone like Orion?! Even to us parents, it's remarkable how similar and gorgeous our littlest ones are. 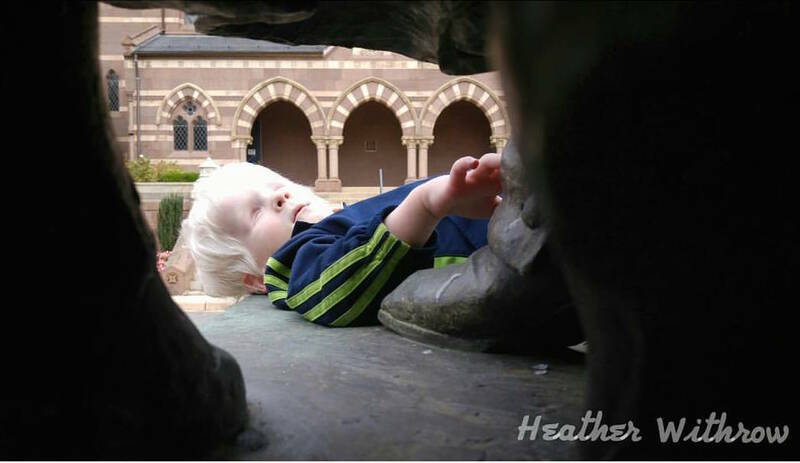 Back in 2012 we learned from our NIH National Eye Institute visits in Bethesda, Maryland which genes had a part in Orion being deafblind. From that, we learned how it was that the rest of us were deaf, except for our hearing daughter. I will share more in a separate post. Clarisa's genetic story may or may not be similar, but looking at these kids and looking at both families and the fact there are Deaf siblings, the answer seems pretty simple: the same genetic dance happened for her. The seas of raising a DeafBlind child is not easy, our two families will have a lot in common, yes, and our children will guide us on their own journeys that may look very different, or actually parallel in experience. Every DeafBlind child, even with similar etiologies who could pass as cousins or even siblings as seen here, is different! 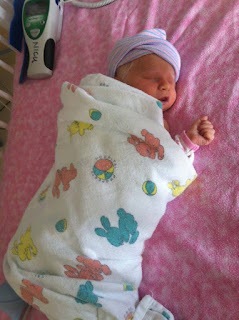 Photo #4: Another swaddled baby burrito! (Image description: baby's head, covered in a fashionable pink and white hospital cap, is sticking out top of the blanket wrap, laying content in the newborn warmer. Talk about the discovery of the final frontier! Gathering information* without our distance senses (sight/hearing)! Exploring the dark depths of our oceans, mysteries of the human mind, putting ourselves in the perspective of our young children, as well as learning of strategies, information and experiences of the parents, friends, role models and professionals who "sailed the seas" before us. We have first row seats experiencing the little, yet burning magnesium bright, accomplishments of our DeafBlind children. *Gathering information: The best in-a-nutshell description of deaf blindness I've seen is that it's an information-gathering disability. Clarisa's dad, Justin, put these photos together side by side to see if friends could tell the two kids apart. Orion is on the left, Clarisa is on the right. UPDATE: I added links below to the posts I wrote exclusively for the Communication Matrix community through the end of December 2015. I also enjoyed interacting with community members via comments. Although I had my two cents to offer, I came away learning so much from our community. Hi friends and family! I've been invited to guest moderate at Communication Matrix Community, contributing from the viewpoint of a parent with a DeafBlind child. Also, the Communication Matrix is an awesome tool to see where a child is at, communication wise. Come check the posts and the Matrix out. No need for choosing a blue or red pill, it's all about communication! Please follow this link to read my first post there: Any Communication is still Communication This post covers what I believe as a Deaf mother of Deaf, Hearing and DeafBlind children about our communication for our children and others. This darned fairy gets in the way of concept development and makes us totally miss the delicious opportunities for expanding on an activity or object. ...It helps us recognize and explain to our community about our children’s ‘voices’ or ‘touch”, that many people probably never realized or appreciated were meaningful communication. 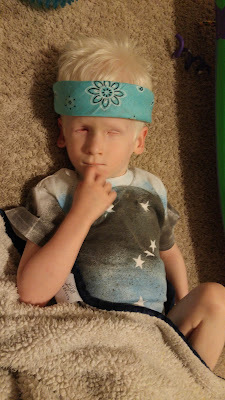 This post leads to a video where I entice my DeafBlind 5 year-old son Orion to feel my signs. Photo description: From left to right in this black and white image focusing only on the heads of three siblings: big brother Skyler, little brother Orion and big sister Anastasia. Skyler and Anastasia's heads are turned toward Orion, kissing his cheeks. Photo credit: Clare Cassidy Photography, September 2014. Two exciting things happened Friday night (12/4/2015): First, Orion signed “MOM” and “DAD”; second, Nyle DiMarco won America’s Next Top Model’s final season (ANTM’s 22nd season). Nyle is Deaf and uses ASL. Have you seen Nyle’s modeling photos? Go Google him up! 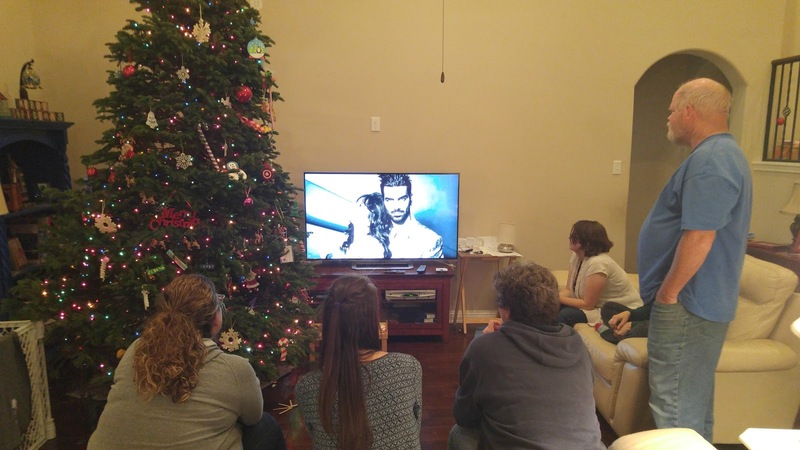 When Tyra revealed Nyle as the winner of ANTM's final season, we erupted in cheers. My Facebook community hash-tagged #NyleDiMarco and uploaded many pictures and videos of jubilant TV viewers from coast to coast. 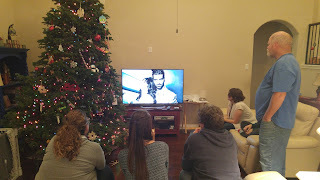 Some of us even gathered around to watch again the announcement of the winner. Orion was with us the whole time. He could sense the excitement in the air, was in a playful, happy mood. Now, regarding, Orion, ​I've got to get (or someone could invest in) one of those body cameras or GoPro thingamajigs, or have a video crew following him around. For now, those brief but awesome moments will have to be for Orion, myself and anyone else who witnesses it. Earlier in the day of Nyle's win, for the first time ever, Orion signed an approximation of "MOM" as I was holding him! 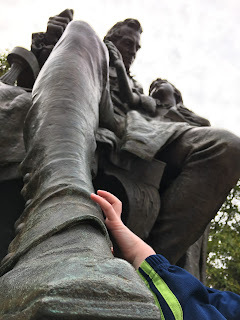 First he signed it on himself, thumb out and touching his chin and his fingers were claw-like (standard sign would be outstretched fingers, but I don't care- it's what he MEANT!) then he touched my chin with his thumb. For five years we signed "MOM" on his chin as a touch cue and in the last couple of years we signed it on ourselves with him riding our hands and on him (pairing touch cue and tactile sign language). Anyway back to the moment, Orion then went on to sign an approximation of "DAD". He was grinning from ear to ear! He knew he did something awesome, I could tell by his intense smile! I handed Orion over to Dad and we reinforced Orion by signing Dad via tactile ASL and touch cue. Did I see that? Did he really sign that? Did he really mean it? There wasn't a camera around. Even if there were, we would probably lose the moment while fumbling to turn the camera on. My husband Thomas and our friend Teri (first to arrive for the ANTM finale party) saw him sign, too, and confirmed it. 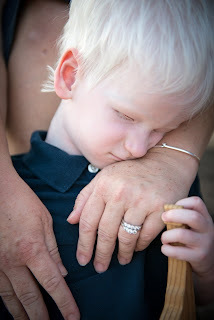 Photo description: Orion, our snowy-haired son holding a wooden toy, leans his head lovingly on Mom's left wrist. Mom's hands appear from out of frame and behind Orion, and are resting on his upper chest, embracing him. Consistency is important. Not just in the routines and labeling but in the fact every member of your child’s team, at home and school, uses the same signs. The same goes for symbols and cues. I encourage parents to find out what signs are used in school with their child and the IEP team needs to stay on top of what signs are used at home. Also important is using the same, standardized signs, cues, and/or symbols, etc. during activities, with the object or person. This way it is more concrete, rather than a distant, abstract notion plucked from outer space. We want to encourage concept development, that way, the labels are able to stick in the child's mind! If you have the opportunity to, go ahead and repeat the sign a couple more times as they are also opportunities for him/her, too, to receive this information. "Look at a stone cutter hammering away at his rock, perhaps a hundred times without as much as a crack showing in it. Yet at the hundred-and-first blow it will split in two, and I know it was not the last blow that did it, but all that had gone before." Now that Orion has signed "MOM" and "DAD", we will not stop doing what we've done all this time because we have also seen him sign words before and never to sign them again. We did think maybe he signed them when no one was looking at him, either we were doing something else or it was at night while everyone was sleeping and he was partying. We would not be able to reinforce, respond, affirm his efforts to communicate. Because of that, we will not stop. A hundred and one blows or five years, whatever the length may be, we need to stay the Orion course! Artist theme going on here! I pump-spray painted Orion's t-shirt, a formerly plain white t-shirt covered in black and blue paint with the distinctive pattern of the seven brightest stars of the Orion constellation on his chest. Orion is also sporting a light-teal colored bandana on his forehead. This bandana-wearing is a De'VIA artist's trademark, who also happens to have white hair, too. Can you guess which artist this is? Recently, I was able to remember to take a video of a modest Orion during bath time to show an example of a shared experience. There are so many opportunities for shared experiences out there! The root of my understanding came from reading an article that discussed mutual touch. This is very important to me as a parent that mutual touch and shared experiences lead to communication opportunities and language development. It all starts small but the opportunities are endless... read on. 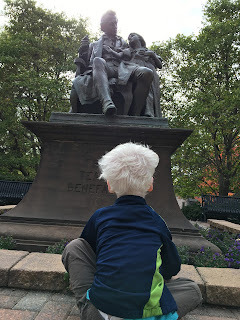 Did you ever think you could interact with your kid like this, "Hey, did you notice a whole lot of bumps, shapes, valleys and ridges on that lumpy kiddie slide?" Yes! You can have a conversation with your kid about this stuff. It even counts when your kid knows you explored WITH him. A review of a sighted child and mother's interaction is mentioned in "Talking the Language of the Hands to the Hands", by Barbara Miles: "Perhaps the most important gesture in language development is the pointing gesture. A mother pointing at an object as she names it (“Look! Doggie!”) is establishing a mutual topic and ensuring that she and her child are focused on the same thing. The word that names the thing can then acquire meaning for the child." And that brings in the blind or DeafBlind child's perspective in the same article. It sure takes a lot of brainpower for me to remember to label things through tactile sign language that Orion and I touch or explore together. Sometimes he's still exploring the same thing or busy exploring the next thing he'd just found, which I don't want to interrupt. (Let his fingers have all the time in touch possible.) Or he's had enough signing input and I can't get a word in (he withdraws his hands or pushes mine away). Or he has a "little" meltdown. It's OK, we all try the best we can. Give him 5 minutes to rest and process his thoughts, try another time or even ask yourself whether he really dislikes that thing. This leads me to a very short video (under a minute) I made of just one of Orion's millions of baths. It's just one little twinkle of an example of shared experiences you can have with your child. There are two shots in the video, the first is of Orion laying in a tub with a few inches of water, splashing the water with his arms. The following shot is the same view but with an adult's hand splashing the water in between Orion's chest and left arm. "He loves to splash the water. He loves to splash with Mom and Dad, too. Splashing together makes it a "shared experience". Solo and shared experiences are fun! Mutual joy: Did you see that contagious smile? Trust: I am here with you. Movement Conversation: I'll watch for signs, anywhere else that isn't the bathtub, that you might be remembering what you were doing in the tub and I can respond by joining you and acknowledging your self-initiated movement and even add some signs to the mix. Meaningful Memories: There's nothing sweeter than knowing someone else shares this very moment with you. Mutual touch and shared experiences have many parallel benefits for language opportunities. Shared experiences have dynamic movements that have better chances of being identified later on in a different context. The movements initiated by a child can actually be used as a sign since it already makes sense to him. The biggest thing of all that I love is that I can "look at things" with my son and he'll know it, too! What a relief it is as a parent to know I can do this with my DeafBlind son. When Orion was an infant, his dad and I wondered how do we get him from the point of a congenitally DeafBlind infant to a tactile-signing DeafBlind adult? Mutual touch was one of the first inklings of opportunities we learned about however Orion wasn't exploring with his hands just yet and now five years later he's much more active with his hands and the opportunities are opening up. Wanna chew on the idea of becoming a Teacher of Deaf-Blind (TDB)? Or DB Intervener? Or IEP provider with specialized training in DeafBlindness? Browse nationaldb.org or message me. Let's have a dialogue on supporting our current personnel and growing more! CEC Competency Based Dialogues to Support Students with Deaf-Blindness by Dr. Amy Parker, posted on nationaldb.org in October 2015. I invite you to read the entire, richly informative article to visualize what has been happening in the years before and to imagine and believe in what could unfold for our DeafBlind children. As mentioned in the article, Council for Exceptional Children (CEC) has knowledge and skill competencies spelled out for those who work with our kids. Even though DeafBlindness is a very low incidence disability, there is a national theme of a need for supporting and developing our current school staff working with DeafBlind children plus a need for more numbers of qualified personnel in this field. The Alice Cogswell and Anne Sullivan Macy Act (a.k.a. Cogswell-Macy Act or HR 3535) that has been introduced in the US House of Representatives, as of September 2015, included "Title III" which is for our DeafBlind children. It also has language, that parallels the needs of our kids' Blind and Deaf counterparts, that they be served by qualified personnel. We still need more support from both sides of the aisle in the House. The bill has yet to be introduced in our Senate. You can read in further detail (and see a list of current sponsors) about HR 3535 at ceasd.org (Deaf/HH) and afb.org (Blind). 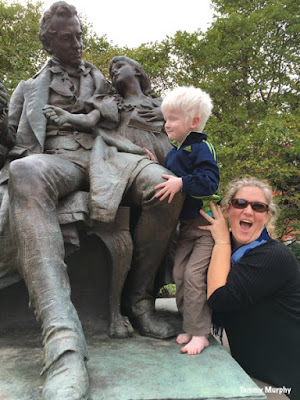 Mom and Orion with the statue of young Deaf student Alice Cogswell and her teacher, Thomas H. Gallaudet on the campus of Gallaudet University. Photo credit: Tammy Murphy. For Texans (and those out-of-state who can make it), the path to becoming a Teacher of the DeafBlind can go through Texas Tech University's "Dual Sensory Impairment Certificate" (a.k.a. DeafBlind, that!). It can be used as a specialty area for Masters of Education in Special Education. Interveners-to-be anywhere can take online classes at Utah State University- https://online.usu.edu/degrees/deafblindness-cert (I hope this is the right link, but it's the right school!) Students go through 8 online credits in one year (two courses), plus do a practicum to receive their Intervener Credentials. A bonus for Texans interested in USU's Intervener Training, there is a scholarship opportunity to pay for your studies! Apply for a DBMAT Intervener Training Scholarship by following this link to further information and criteria- http://www.dbmat-tx.org/intervener/scholarship_letter.html This scholarship is made available through the hard fundraising work of family members of Deaf-Blind Multihandicapped Association of Texas (DBMAT). In other states, you can reach out to your state DeafBlind Project and inquire about Intervener scholarship opportunities they may know of. State DeafBlind Projects (<- follow the link to a national list) are also sources of workshops of whatever length of time on a variety of topics in Deafblindness for both professionals and family members. View of Orion from the shadow of Alice Cogswell, the Gothic Revival style stripes and arches of Gallaudet's Chapel Hall is seen in the background. Orion's right hand is touching Gallaudet's left ankle. Seated Orion, with his back to us, faces south toward the statue. Even though he does not see it, he has "been there". I would presume he would remember the cold metal, the feet and legs (both human and chair). Repeat visits would be needed for him to build the complete statue in his mind. Orion finished Extended School Year (ESY) last Friday and isn't due to return to school until it starts for the 2015-2016 school year on August 24th. He slept through our Mayfield Park peacock visit earlier this week. The plump, poshly plumed peacocks were very close to His Highness as he snoozed in his special stroller. 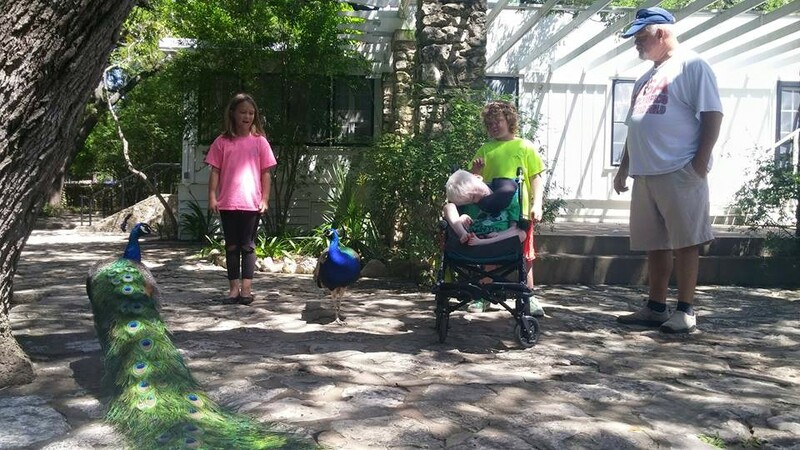 Orion, in the stroller, as Anastasia, Skyler and Dad looked at the peacocks. Not only this week, but in the last couple months, he has been interested in getting up and walking with assistance to certain destinations: Mom and Dad's bed, the bathtub, and his highchair. Several times this week he walked from his playroom (it's his bedroom but he still sleeps with us) all the way to his highchair in the kitchen. The same thing happened from the office in the front of the house to the kitchen in the back of the house. I wish he'd like to use the walker we borrowed for him. Our backs are saying, "Ow!" as we hunch over or squat to support Orion at the armpits. I even walk on my knees to save my back. Often he prefers to be held, all 37 pounds of him. I've joined a membership program at a nearby massage establishment. It may still not be enough. Now, how did we know to go to the kitchen, bed or bathtub? We didn't. We followed his footsteps. We admire his knowledge of the territory, we admire that he knows what he wants and where to go for it. A foot in front of the other... He's getting plenty of footage in! One day Orion will be able to cover a mile and reach beyond, just like his I Run 4 buddy Greg! 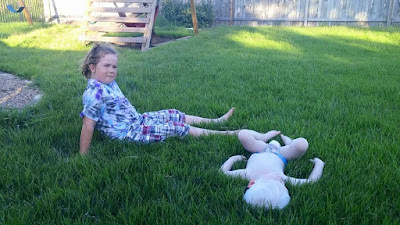 Skyler and Orion relaxed on the plush backyard lawn in the evening shade. Orion is currently in a 4-week ESY (Extended School Year) at TSD. There's been a "change of guard" with a new teacher who's been working with him during ESY. We are blessed she will continue on to be his teacher for the upcoming academic year. Orion will be in KINDERGARTEN! Be still, my heart! I'm sharing a video of Orion transition to the pool during the first week of ESY (also the first week with his new teacher). There is always an adult with Orion, from getting on the school bus in front of our house in the mornings all the way to getting off the bus at home. To see other Orion videos, you're welcome to visit the "Video" tab which is between the top of this post and the bottom of the blog header. Orion is not actively expressing himself using sign language but does sign something once in a while, the top three most used Orion-expressed signs are bread, milk, and more. We are committed to exposing him to tactile ASL and still using touch cues, object cues and tactile symbols during his routines at school and at home. I followed behind Orion and his teacher into the TSD Pre-School lunch room to observe them using tactile symbols and tactile sign language during lunch time with the now and finish boxes. I saw some activity amongst the 4 little kids at one table and later learned that one little guy told one little girl in cute little sign language, "That's Orion's seat! You need to move." I did see Orion walk with assistance behind one seated boy to settle down next to him in his designated seat. It was bizarre and heart-warming to see Orion among kids of similar size, having walked and sat down in a typical classroom seat and eating with his hands just like the other kids. Orion doesn't try to interact with the other kids but I appreciated the kids acknowledging him. 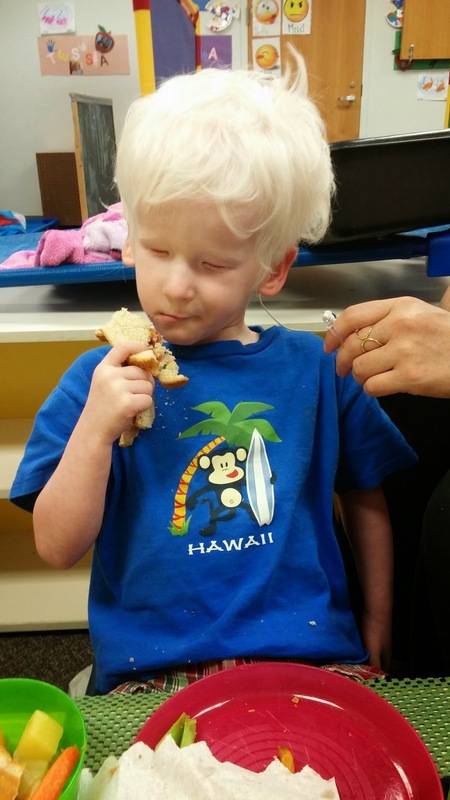 Orion, mid-chew, holds a sandwich in his right hand while his teacher holds his attached CI processor off his left shoulder. Orion ate at Orion-pace and the other Pre-Schoolers were settling down for nap while Orion was almost finished with his lunch. The lights were turned off. Orion was unaffected and the adults working with him, including myself, transitioned to moving around in darkness. I mused that totally DeafBlind people probably chuckle at sighted people when the power goes out. I know who to seek in these situations! Zipping south on Mopac in our van, Orion checked out the breeze. Orion felt the pleasant, warm wind outside the van with his hand turning at the wrist just outside the window, fingers outstretched like five dogs checking the outdoors. 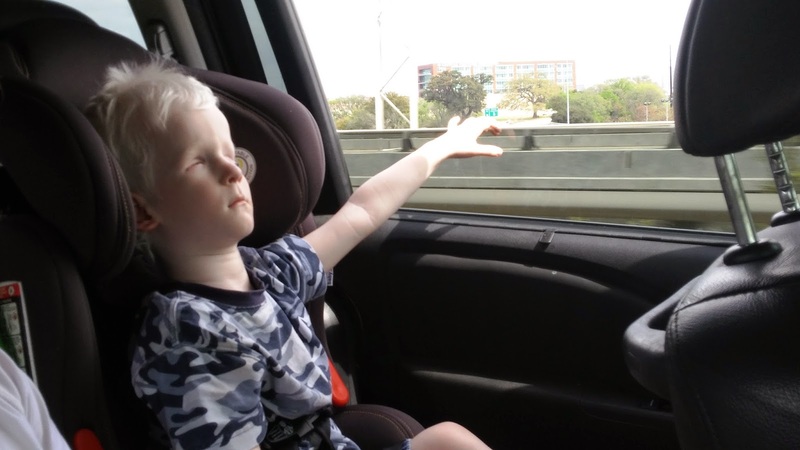 At four and a half years old, his arm was barely long enough for him to do this! As big brother Skyler watched this, he saw a guy in a vehicle in the next lane wave back. It was a simple, very sweet, fleeting moment. I loved this. This guy didn’t know the kid was blind. Look at the effect a DeafBlind kid has around him! The same goes for a smile and even a friendly hand wave. Photo from left to right, seated: two communication assistants (one with a wireless Apple keyboard), Haben Girma with her refreshable braille display, and behind her, a standing ASL interpreter for the audience. CART is projected on a screen in the background. This photo above was taken during the TX DeafBlind Symposium breakout session on advocacy with our graceful Deafblind attorney Haben Girma. 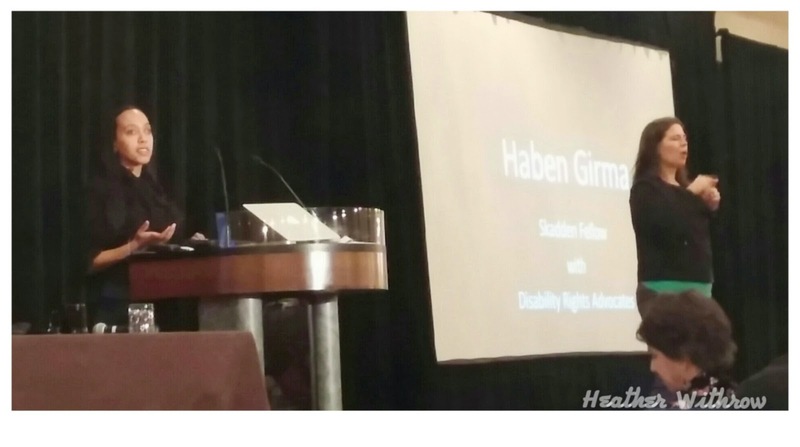 Haben was the first deafblind person to graduate from Harvard. Also out of the frame of this photo were two teams of CDIs (Certified Deaf Interpreters) tactile interpreting for two Deafblind individuals in the audience. It was a refreshing experience knowing everyone had access to what was going on in that room. Earlier, during her part of the keynote presentations, she shared about her journey as a Deafblind person, from trying to fit in at her school to now truly enjoying being different. She identifies herself as Deafblind. I agree with her about using "Deafblind", in one word, rather than Deaf and Blind, Blind and Deaf, etc. Personally, I understand Deaf plus Blind does not compute correctly to represent the challenges and identity of being Deafblind. Deafblindness is so different than being only Deaf or only Blind. I had the pleasure of talking with Haben in person about countries we visited and one I have yet to visit that she already did: Turkey. We communicated via the keyboard and her braille display and then moved over to tactile sign language with a bit of Pro-Tactile/affirmative-touch feedback on her arm. She had a person at her side relaying facial expressions and whatever else, on Haben's back, (also a component of Pro-Tactile) that they agreed in advance that she wanted to know. It was a pleasure! Her name sign is the letter H pointed down at the open, upward-facing palm of the other hand in the motion of the sign for dance, to represent her lifelong love of dance. She particularly enjoys partner dancing. The entire symposium was successful and inspiring. I look forward to the 2017 Texas DeafBlind Symposium. Haben, if you're reading this, I look forward to the next time we meet! Haben Girma spoke during her part of the keynote presentations at the Texas DeafBlind Symposium. She received questions and audience information via her refreshable braille display on the podium, an ASL interpreter for the audience stood around 5 meters to Haben's left. Orion chills with Mom/Heather on the grass. I had a moment of clarity explaining how Orion learns as a totally DeafBlind child, while I was cutting an applepear... or was it pearapple? Either way, it was delicious! At dinnertime during my daughter's slumber party last night, Orion crawled into my lap from the chair next to me and leaned against me while I multi-tasked cutting the papplear. I was chatting with my mother-in-law. (We were signing, my MIL is Deaf, too.) She offered to help me cut the fruit. I might've as well been pulling a wood piece out of a wobbly Jenga structure. What a catch-22! Yes, her help certainly would make it easier on me, however, Orion would think fruit just pops up as ready-to-eat slices on a plate in front of him. Orion picks up information through touch via other parts of his body about what's going on in his environment. Even as he sits calmly on my lap, he's feeling my arms moving purposely as I sign. When he decides to follow my arms to the appearple, he can feel the top of the knife as I push it down. I love it when Orion accepts my invitation for his hands to ride on top of my hands (a.k.a. "Hand-Under-Hand" as I work. It's even better when he decides to do it himself. Oh, yes, I DO worry about cutting him!! I would avoid letting a sighted 4 year-old do the exact same thing, it is not safe. A sighted 4 year-old would see me cutting the fruit and learn the function of the knife. In Orion's case, he's totally deafblind and learns mainly through his sense of touch. By letting him touch the knife he almost understands the knife's function and that the fruit is whole at first before I peel, which is safer with a peeler, and then slice it. I fully agree and understand when I hear at workshops that we need to let our kids fall. This applies to all kids, let's call it universal learning! Now, we definitely will intervene if it may cause serious injury, for example, top of the stairs, or the unprotected edge of a drop and we suspect our child or individual doesn't know what's ahead. In fact, Orion started to get himself up into a sitting position independently the day after no one was there to catch him as he leaned back from practicing sitting upright for longer periods of time. Hey, there's hay on your hands and knees, Orion. And now for the messy. Tonight, Orion was brought out to join us around our fire pit for roasted marshmallows. He felt the empty prongs of the metal roasting stick, ate a marshmallow straight out of the bag and felt me put one on the stick and it disappeared from his touch. I had one already slow-roasting (I don't like my marshmallows burnt!) so I brought it to Orion's hands where he felt the warm stick toward the roasted mallow. He took a few bites and decided he didn't want the sticky marshmallow and pushed it away. He ended up with a sticky mess on his hands and around his mouth BUT he was checking out how sticky his hands were, then his knees, then his feet, then the grass... He looked like the son of scarecrow reaching puberty with grass on his feet, knees hands and a little on his cheek. It was messy, yep, but he was experiencing and learning more about different textures under the pleasant smell of a small campfire with his mom. I figure with the danger and the mess, Orion will know that fruits can be peeled and cut. He will know s'mores, the different states of matter marshmallows and the contentment in hanging outside with family by the fire pit. Because Orion's memories will be through touch, smell, taste, experience and emotion, I hope he will also enjoy connecting the senses of his family whenever he smells a campfire. As for the the origin of the peapprle, we will create direct learning opportunities for Orion to connect the fruit to the twig, and the twig was on the branch, and the branch was on the... by finding a tree with fruit in it and have him pick it off. We will also need to plant a seed in the dirt, water it, feel it sprout out of the soil, then visit it often as it grows. Orion will will one day 100% understand knives, after his first knife accident; he will 100% understand why something is dangerous and hurts. *shudder* These are the learning experiences I will not create, I will do all I can to allow him to explore and learn enough and not get hurt. I can see it in Orion's face, he is happier and his life is so much richer with each and every opportunity for him to reach out and experience whatever situation or setting he is in. We want to show Orion, this is what Life has to offer and let him seize it, Orion-style. Orion and the rest of us enjoyed the pearapplepearwhateverbecauseitwassogood! Skyler and Anastasia discuss the game of tag. Skyler ran around in the night with a light under his shirt like Iron Man, with holiday lights in the background. Sticky boy next to the fire pit. As a musing, caring, concerned mom of two sons at Texas School for the Deaf, after witnessing on Feb 9th, Senate Finance Committee members discuss (ranging from casual, cautious, to serious) about the sale of the land TSD is on, I share a YouTube introduction to Treasure TSD. I gathered that our Senators do support and believe in our school's performance and potential so I am flummoxed with the idea of even selling, even if just a little part of the land TSD sits on for a one-time fund source. 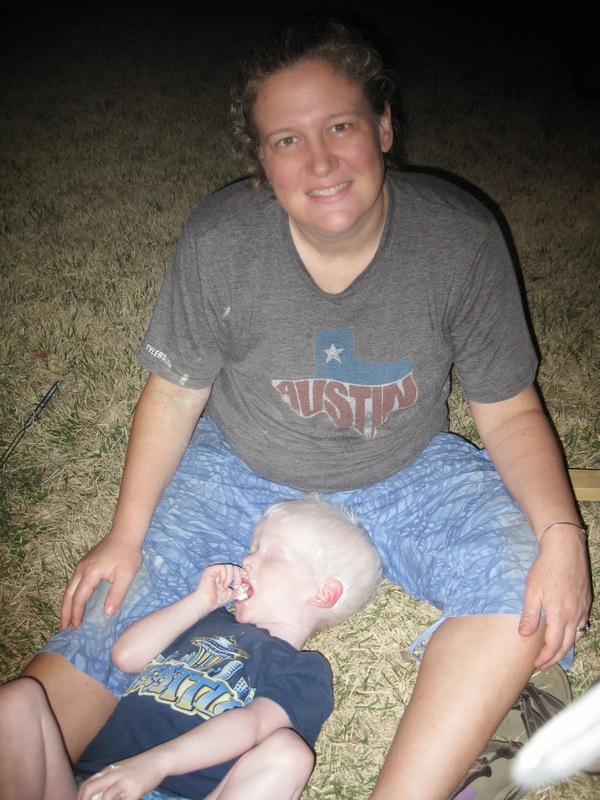 Save every bit of the land and school where Texas' Deaf/Hard of Hearing/DeafBlind children learn/learned. Sure, Orion's an exciting kid... at the caliber of a Seahawks surprise come-from-behind victory. Tonight, he pulled himself up to standing using the upstairs railing for the kids and I to see! In this 2 minute video, Orion is seen crouching, flat on his feet, practically sitting on his bottom as well and really checking out the straight and twisted metal balusters with his hands. Fast forward a couple minutes, he pulls himself up using the balusters; takes a couple side-steps to our delight; to our fright he also tries to climb over! After around 4 to 5 minutes upright, he lowers himself to sit and lay down. Good job, Orion! Now... does anybody out there have a good suggestion how to keep their kids from climbing over the 2nd story railing? Forget about saying, "No". We need something physically in place. Thanks! An Orion adventure today: I was tinkering around in the kitchen and I noticed Orion wasn't in the TV room. "Where's Orion?!" Not in the kitchen nook, not in the hallway, so I walked into the master bedroom where Thomas was napping. There he was! Orion was practically on his dad, trying to put his feet up the back of his shirt! The photo shown here was taken on a different day but was probably what Orion did to get up on the bed. Way to go, Orion!! up the side of a high bed.